By Sadiq Umar – Ahead of the general elections scheduled for February, the Interfaith Dialogue Forum for Peace (IDFP) has called on the government to control our national borders to arrest the challenge of influx of illegal aliens. The call is coming on the heels of the controversial appearance some delegations from the neighbouring Niger Republic at the All Progressives Congress (APC) presidential rally in Kano last week. The body called on the Independent National Electoral Commission (INEC) to display independence and be impartial in the conduct of the 2019 General Elections. The forum also expressed concern on the security situation in the country and urged government to take necessary actions. IDFP made the calls in a communique jointly signed by its co-chairmen, Alh Ishaq Kunle Sanni and Bishop Sunday Onuoha. The communique just released in Abuja was on IDFP’s General Assembly Meeting held at the Federal capital on January 16, 2019 with the theme: 2019 ELECTIONS AND NATIONAL SECURITY: THE ROLE OF INTERFAITH COMMUNITIES. The Interfaith Dialogue Forum for Peace (IDFP) was established as a national interfaith and intercultural dialogue platform through funding and facilitation of the International Dialogue Centre (KAICIID)), Vienna Austria. The IDFP was formally inaugurated on 16th January 2017 in Abuja Nigeria with 100 Christian and Islamic leaders evenly divided. 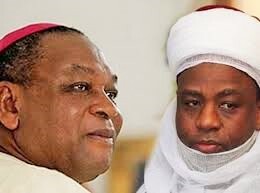 The Sultan of Sokoto and the President of the Christian Association of Nigeria are the Patrons of the IDFP. KAICIID is an intergovernmental organization that promotes dialogue to build peace in conflict areas. It does this by enhancing understanding and cooperation between people of different cultures and followers of different religions. The Centre was founded by Austria, Saudi Arabia and Spain. The Holy See is the Founding Observer. Its Board of Directors comprises prominent representatives from five major world religions (Buddhism, Christianity, Hinduism, Islam, and Judaism). The Board designs and supervises the Centre’s programmes. 3. That the political, religious and traditional leaders and all relevant stakeholders should be careful in their choice of words to avoid heating up the polity.